October 28, 2010  The Obama administration has come under criticism for its lack of job creation and economic growth, but Cord Jefferson of The Root argues that many of its accomplishments have gone unnoticed. In fact, the administration has implemented many policies that serve and protect minority communities. October 28, 2010  Essence magazine’s latest issue aims to stimulate a national dialogue about race in America that informs and empowers African American women. Another recent feature from Essence is an online profile of an African-American lesbian couple. October 27, 2010  Guest blogger Jeff Yang explores how politicians are using the Chinese culture as a political weapon in Mid-Term election campaigns. October 27, 2010  Several tight races are in states with significant black populations, giving black voters an uncommon chance to tip statewide contests. 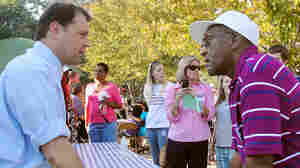 To rouse black voters, Democrats are "fighting fire with fire" to counter what they call a racial undercurrent in rhetoric from Republicans and Tea Party activists. October 23, 2010  Across Europe, economic woes and fears of terrorism are feeding anti-immigrant -- particularly anti-Muslim -- sentiment. Last weekend, German Chancellor Angela Merkel added fuel to the debate when she said Germany's attempts to build a multicultural society had "utterly failed." Host Scott Simon talks to Josef Joffe, publisher-editor of the German newsweekly Die Zeit, about the situation. October 22, 2010  Guest blogger Jimi Izrael responds to fired NPR Analyst Juan Williams' remarks that suggest his ouster had something to do with his race. Izrael says, while he doesn't think skin color is the reason Williams was let go, he doesn't believe it helped. 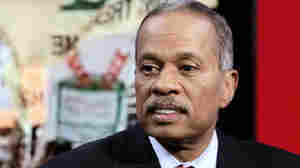 'Shop Talk': Was NPR Right To Oust Juan Williams? October 22, 2010  Tell Me More's weekly Barbershop segment discusses NPR's firing of Juan Williams over his remarks about Muslims on the Fox News Channel. Host Michel Martin talks with author Jimi Izrael, civil rights attorney Arsalan Iftikhar, sports writer Dave Zirin and columnist and author Reihan Salam. October 22, 2010  National Public Radio was widely criticized for firing news analyst Juan William for saying he gets nervous when seeing people in full Muslim garb on airplanes. He made the comments in an interview on Fox TV's "The O'Reilly Factor" and stressed that it is important to distinguish moderate Muslims from extremists. To learn more about the journalistic ramifications, host Michel Martin speaks with Asra Nomani, author of “Standing Alone: An American Woman’s Struggle for the Soul of Islam,” Richard Prince, author of "Journal-isms," an online publication about diversity issues in the media, and John Watson, associate professor of communications law and journalism ethics at American University. October 22, 2010  In Virginia, a new textbook for fourth graders has created a stir. The line in question claims that thousands of blacks fought for the South in the Civil War. It's a claim disputed by most historians and an idea pushed by some to minimize slavery's role as a reason the war was fought. October 21, 2010  NPR producer Veronica Miller says it's been a great week for girls of color. Two videos -- one with a muppet, the other by a budding child star -- are circulating the web and helping young girls celebrate their beauty and individuality. Is Morehouse Ready For The 'Mean Girls'? October 21, 2010  A Vibe magazine article titled "The Mean Girls of Morehouse" profiles four students who attend Morehouse College -- the nation's only all-male historically black institution -- but dress in women's clothing and identify themselves as androgynous.